This chapter will discuss the connections between headaches and ­epilepsy in sleep-disordered breathing. 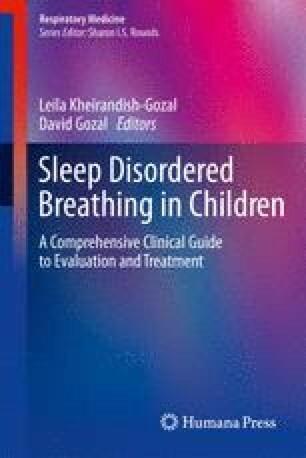 In both adults and in children suffering from sleep-disordered breathing (SDB), headaches are a common complaint, and headache itself may be the presenting feature of obstructing sleep apnea (OSA). OSA has been found in children complaining of early morning headaches and as well as in specific headache syndromes, including migraine and tension-type headaches. Overall, the prevalence of OSA in patients with headache has been reported between 54% and 89%. In general, the most common complaints among the pediatric population with epilepsy have been related to poor quality sleep and anxieties about sleep resulting in excessive daytime sleepiness. Different aspects of epilepsy, such as use of antiepileptic drugs (AEDs), seizure frequency, and sleep-related seizures, may be possible contributing factors to sleep disturbances; however, some studies have found that OSA per se can be the sole predictor for daytime sleepiness in patients with epilepsy. Retrospective and prospective studies in children and adults have shown that up to 63% of patients with epilepsy are affected by SDB.